This is a guest post by Angel Carsolin, business development officer at Comparakeet, a company that reviews software. If you’re planning on building a membership website, there are many website builders that are easy to use and have lots of membership features. When it comes to membership website builders, Wild Apricot is at the top of its league. Their platform was built specifically for membership organizations and includes many additional features like registration forms, event calendars, forums, and membership databases. Their editor is also flexible for all kinds of users; the interface is extremely easy to use for beginners, but you can also tweak CSS settings or modify an existing site if you already have one. What's more is your website comes ready with a robust membership database and emailing system so you can analyse your members and communicate with them at ease. Moreover, they have six plans to choose from that can fit your needs and budget — whether your group is just growing, or if you already have an established member count running in thousands. Subscription-level Options: Multiple membership levels with subscription fees and periods, and benefits. Add the contents, and save. Wild Apricot is an all-in-one solution for membership organizations. All of their features are centered on building a community, which is no wonder why they have a whole variety of clients like associations, for-profit and non-profit organizations, health and sports clubs, societies, fraternities and sororities, and many, many others. You can try out their free trial, which runs for 30 days to see what they have in store. Despite lagging behind other competitors in terms of design, Doodlekit offers a decent service when it comes to building a membership site. If you aren’t much for flaunting, then Doodlekit should be enough – especially since hosting is included, among other essential features. Doodlekit is designed for those who want to build a website right away and do not mind having a simpler design and basic features. If you have little resources to spare for the project, then their free plan is a good package — it includes 1000 GB of bandwidth and 100 MB of storage, enough for a starting your website. IM Creator was founded by members of Wix’s developer team (Wix is also a website builder covered in this list) with the goal to provide an easier website builder that offers a higher level of design. And while they have yet to offer features that will put them on the top spot, their tools are good enough to create a stunning website with little effort. For membership-centered features, you can add a plug-in to their editor, although this may cost a little more. But since you have a wide range of elements to choose from like form builders, social feed, event board and gallery, and poll and survey forms, the extra charge may be worth it. SquareSpace offers a complete website builder package, but you will have to install plug-ins to turn it into a membership site. Some features include: attractive templates, web hosting, SEO tools, and eCommerce options, among other essential features. They are straightforward with the difference between their two plans, so you won’t be confused about which one to choose. All users also start by registering for their free trial, so you can see what they have to offer before making a commitment. Similar to other website builders, you can also add plug-ins to your website for more functionality. These plug-ins can apply protected pages and content for members-only access, log-in forms, and user profiles. Unfortunately, SquareSpace has not yet opened an in-house membership solution, so you have to shell out extra to apply these plug-ins to your account. Sub Hub has been providing a membership builder for more than a decade now. Focused on creating a community, they have membership-centered features that can make start-up and management easy for admins, and a handful of other tools to make the website stand out from the rest. Their prices are a bit steep though, so their service may be for organizations with more resources, financially speaking. Moreover, while their features are perfectly good for smaller organizations, communities with a larger base will have a greater benefit from them. Sub Hub may be expensive, but it is well worth the cost for what you are getting. Everything that you need is within their builder — there is no need to install third-party plugins that need extra steps for configuration and may occasionally break and cause issues for the members. They also have payment processors from a handful of countries for international organizations. WebStarts is an affordable website builder that offers basic functionality with an emphasis on social media integration — this is actually a great way to reach out to the larger population and grow your member count quickly. Their templates aren’t the newest in the block, but they are quite pleasant to look at. Webstarts offers a cheap way to build website, complete with contact forms to gather needed information from your members. Their bandwidth allocation for lower-tiered plans is a bit limited though, which makes them more fitting for starting organizations, but not much for growing communities. Weebly is another general membership website builder that has gained popularity, thanks in part to its ease of use and modern designs. Although their most marketed features are more fit for blogs and online stores, they added membership features a few years ago for those who want to build one using Weebly’s tools. They also improved some features so users can accommodate more members and make management a flawless experience for the admins. Weebly added membership features to its service last 2014, where Pro websites can have up to 200 members. Business websites, on the other hand, have unlimited membership allocation. These membership centered features, combined with stunning and highly customizable templates, gives members a visual treat whenever they visit your pages, while letting them enjoy the perks of their subscription. Wix is one of the crowd favorites when it comes to website builders, and for good reason. They have over 90 million users from 190 countries, and enjoys an average of 45,000 new sign-ups daily. The main reason for this popularity is that their builder caters to a wide range of categories. You can create just about any website for personal, professional, or business use. This includes restaurant and hotel websites, portfolios, blogs, and of course, membership organizations. One of Wix’s strengths is that they have an App Market where you can find free and paid apps and services to add to your website. Some of the community-centered apps include forums, log-in pages, form builders, event calendars, subscriber boosters, schedulers, and live chat add-ons. WordPress is a powerhouse when it comes to website building, powering 27% of all sites on the web. Given the flexibility of their platform and the vast selection of themes available, it’s no wonder why they are dominating the market. Building a membership does not have to be technical as well, since there are a number of plug-ins available to make the process easier. WordPress plug-ins that are designed for membership include DigitalAccessPass, MemberPress, and Memberful. They each have a subscription fee which can be a bit expensive, but given that using WordPress itself is free, it’s the only thing you have to worry about. If you are looking for a membership website builder that thrives on simplicity, then Yahoo Web Hosting should be one of your options. Their platform is designed specifically for beginners, with a building process that is easy to digest, plus rates that are cheap and reasonable. Their templates are not the most eye-catching when compared side-by-side with other platforms, but they are more than enough to create a professional-looking website. for anyone to use. For higher-tiered plans, they also allow third party design tools, which may be needed since their in-house templates are a little outdated. They also offer shared SSL certificates with bank-level encryption, so all of the data entered into your website is absolutely secured. 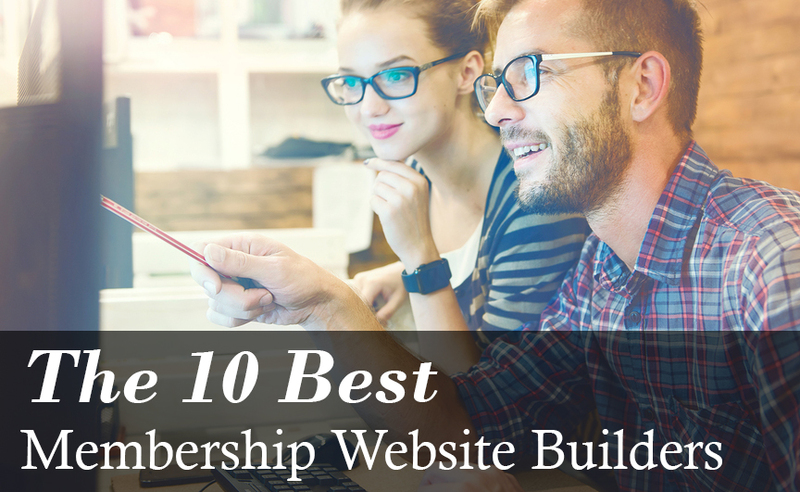 There you have it, the ten best membership website builders available to date! If you need more help deciding which membership website builder to use, check out Comparakeet’s reviews and comparisons on each of these builders. You'll have a much better idea of which suits your organization best. As a business development officer at Comparakeet, Angel ensures the company's continued growth on a daily basis. In her free time, she enjoys redditing, playing video games, and indulging in general merriment.